Who ate all the pies? Who ate all the pies? Use as a part of your 5-a-side a day! Introduction: Jeffrey “Jeff” Astle (13 May 1942 – 19 January 2002) was an English footballer. He played 361 games for West Bromwich Albion, scoring 174 goals, and was one of the most iconic players in the history of the club. He also won five caps for England, but did not score any goals. 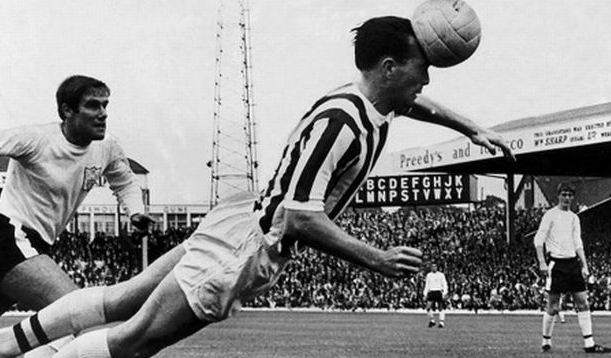 The Albion fans nicknamed him “The King”. He would appear on the TV show “Fantasy Football League” with Skinner and Baddiel where he would sing during the closing credits. 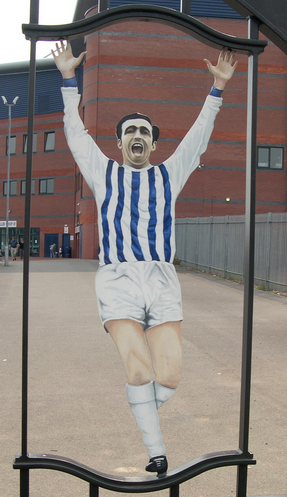 Jeff Astle is celebrated on the gates of the Hawthorns. This recipe is based on a traditional Staffordshire beef lobby, The King of stews. Put the meat, onion and pearl barley in the casserole and cover with water. Bring to the boil and then simmer gently on a very low heat for 40 mins. Stir occasionally to prevent it from sticking. Meanwhile peel and chop the vegetables to dice of a similar size. Add the vegetables to the casserole and top up with stock to cover the vegetables. Bung in the oven for approximately 60 mins or until everything is softly cooked and the meat is tender. Season to taste. Serve in big bowls with chunky bread. 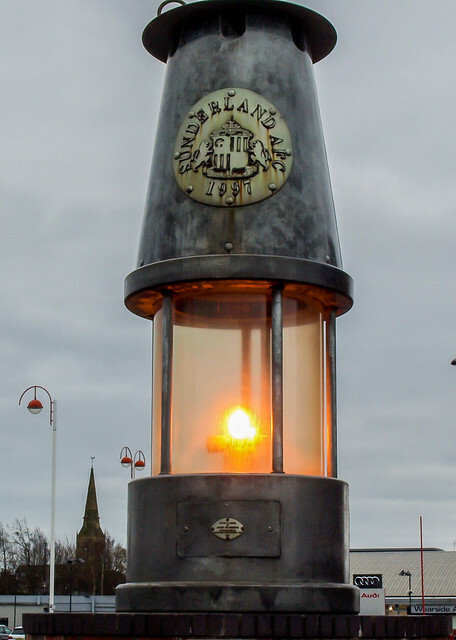 A Davy lamp monument stands at the entrance to reflect the coal mining industry that brought prosperity to the town. The origins of this dish start in Front Road, Ford Estate, Sunderland by families of Irish immigrants. The Wearside Panaculty uses tinned corned beef, onion, sliced potatoes and gravy. Here it is baked in the oven in a casserole dish. 1 pint of thick brown gravy, preferably left over from Sunday lunch. Sprinkle some of the vegetables into the bottom of your casserole, then a layer of the onion slices, a layer of potatoes covering the entire base of the casserole. Break up 2-3 slices of the corned beef and spread over the potatoes. Add more mixed vegetables, then another layer of onions and another layer of potatoes. Now the rashers of bacon go on then another layer of corned beef, mixed vegetables, onions and finish with a potato layer. Once you have finished all the layers, carefully pour on the cold gravy, this should fill the casserole to about 3/4 full. Pour in some water if it does not. Cover and bake in the oven for 1.5 hours/1 kickball match. Upon return from the match turn up the temperature up to 180oC. Bake for a further 45 minutes while you have another pint or two. Remove the casserole lid and return to the oven to crisp up the top layer (usually another 15-20 minutes). Be careful to check the dish regularly at this point as the gravy may dry out. Sprinkle a little water on if necessary. Stick in the serving bowls and serve with crusty bread. 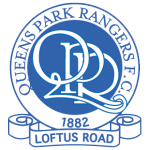 Introduction: Queens Park Rangers Football Club were founded in 1886 after the merger of Christchurch Rangers and St. Judes Institute. Their traditional colours are blue and white. In the early years after the club’s formation in their original home of Queen’s Park, games were played at many different grounds until finally the club settled into their current location at Loftus Road. Owing to their proximity to other west London clubs, QPR maintain long-standing rivalries with several other clubs in the area. The most notable of these are Chelsea, Fulham and Brentford, with whom they contest what are known as West London Derbies. 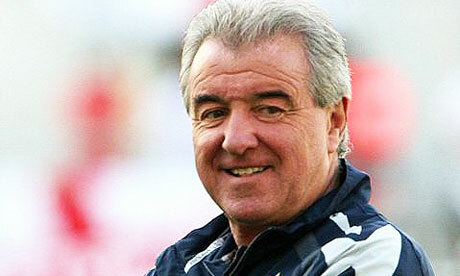 Terence Frederick “Terry” Venables (born 6 January 1943 in Dagenham), often referred to as “El Tel”, is an English former football player and manager, as well as being a media pundit. During the 1960s and 70s, he played for various clubs including Chelsea, Tottenham Hotspur and Queens Park Rangers, and gained two caps for England and he managed Queens Park Rangers as well as being a director of the club. El Tel has also co-authored four novels with writer Gordon Williams and is the co-creator of the ITV detective series Hazell, about a fictional private detective named James Hazell. Heat the oil in the large frying pan and quickly brown the sausages over a high heat, turning often. Turn the heat down to its lowest setting and leave to cook gently for 20 to 30 minutes until cooked through, turning every so often. While you keep an eye on them, put the potatoes into the large pan with salted water, cover, bring to the boil, then reduce the heat and simmer for 15-20min until tender. Shove them in the colander and leave to steam dry for a couple of minutes – this stops your mash turning watery. Now concentrate here; in the medium saucepan melt half the butter and fry the leek over a gentle heat, covered, for about 25mins until softened. Melt the remaining butter in the now empty potato pan and add the milk. Add the potatoes and mash until creamy. Stir in the leek and mustard. Slop the mashed spuds onto the warmed plates, I like to stick the sausages into the mash and spoon on the red onion marmalade. Introduction: This is a bit convoluted so pay attention… The Stanley Cricket Club of Byker was later formed in November 1881and renamed Newcastle East End F.C. in October 1882. In 1886 Newcastle East End moved from Byker to Heaton. In August 1882, Newcastle West End F.C. formed from West End Cricket Club, and in May 1886, the club moved into St James’ Park. The two clubs became rivals in the Northern League. In 1889 Newcastle East End became a professional team, before becoming a limited company the following March. Newcastle West End were in serious financial trouble and approached East End with a view to a take over. Newcastle West End were eventually dissolved, and a number of their players and backroom staff joined Newcastle East End, effectively merging the two clubs, with Newcastle East End taking over the lease on St James’ Park in May 1892. Pan Heggarty is a traditional dish from the north east of England. It is a filling dish and a cheap way to fill stomachs. The linguistic the root of Heggerty is probably the same as haggis , both derived from the French “hache” meaning chopped. Par boil the spuds in the saucepan for 10 mins and leave to cool, running them under cold water helps. Fry the bacon in the large frying pan till crispy. While that is happening roughly grate the large potatoes into a large mixing bowl (large potatoes are easier to hold than little ones) then crumble in the crispy bacon and mix in the onion, cheese and chopped parsley. Make 4 patties out of the mixture. Add some oil to the bacon fat (also called lard) in the frying pan and on a high heat fry the patties until they are crisp and brown, about 4 minutes a side. It is best to do them two at a time or the patties do not crisp up. Lay the table with the away kit and serve and eat as soon as they have cooled down enough, with salad if you must. Introduction: Vincent Jean Mpoy Kompany, is a very nice Belgian chap and captain of Manchester Citeh. That is how you spell it according to my friend and fervent Citeh supporter Phil Clews. Mr. Kompany is an ambassador for the SOS Children’s villages charity that provides education and safe accommodation for children living in poverty in the Democratic Republic of Congo, where his dad comes from. He is listed 23rd in the world’s top 100 kickball players. This recipe is ideally suited to a kickball day. You make it on the day before and stick it in the fridge to fester. It cooks best from a cold oven so you can set the oven to finish cooking when you get back from the match/pub (ask a young person how to do this). Spread half of the grated potatoes in the lightly greased baking tray, tin or glass it does not matter. Then layer on half the onion, all the sausage meat, the remaining onion, green pepper, mushrooms and half the cheese. In the bowl, whisk together the eggs, milk and seasonings. Pour this mixture over the casserole; top with remaining grated potatoes and cheese. Cover with cooking foil and refrigerate overnight. Place the casserole in a cold oven and bake, covered, at 180oC for about an hour. Uncover and bake for a final 20 minutes to brown the top, test by inserting a knife into the centre, if it comes out nice and clean we’re done. Serve at once on warmed plates with nothing, it’ a meal in itself. Introduction: Craven Cottage has been the home ground of Fulham since 1896. Its current capacity is 25,700, the record attendance was for a game against the Millwall Dockers on the 8th October 1938 and stands at 49,335. This pie should be made with King Edward potatoes as they were named after King Edward VII who was King when Fulham ascended to the football league in 1903. Heat the oil in the saucepan over a medium heat and fry the onions until soft, then add the beef, keep frying until the beef is evenly browned, this will take about 10 minutes. Now pour in the two cans of tomatoes, Worcester sauce and the frozen mixed vegetables. Season to taste, with salt and pepper, cover and simmer for 30 minutes. While that’s happening, cut the potatoes into small chunks (they cook quicker) and boil them in salted water until soft. Drain and mash them to smithereens with the butter. Now it all comes together. Lightly grease the baking dish and spoon in the mince mixture. Spread the mash over the top and sprinkle the cheese over the mash. Place in the oven for 30-40 mins until thoroughly hot and the cheese is bubbling. Serve on its own on piping hot plates. It’s a meal in itself!